Pudhu Mandapam Madurai is the famous and the oldest shopping complex known to people. King Thirumalai Nayakar built it. It was summer adobe or rather a place to host annual functions then. Pudhu Mandapam Madurai was once situated in between water canals. It allowed the mandapam( hall) to maintain the temperature. The Avani festival( float festival) and many other festivals during the summer month was held in Pudhu Madapam. Slowly it turned out to be a famous shopping complex, the main reason I believe is that people visiting Meenakshi Temple usually come and go out the East Entrance. It is the reason why pudhu mandapam might have changed to be a shopping place. You can find shops which sells vessels( brass, aluminum,wood etc) on one side. Most of the residents in Madurai would drop there to find some traditional vessels. Of late I was searching the very famous Vengala Vatti(a Bronze bowl ,used for various events in a Tamil Custom). Finally after hours and days of all around Madurai. My mom suggested “Last try , Puthu Mandapam ? ” . Finally I got one, or many ! On the center of the mandapam you can find stores selling traditional artificial jewels, souvenirs, cloths and lots of curio items. On the other side, you can find books and shops selling sarees and handlooms. You can also find tailors who at a very less price and very little time stitch blouses and dress. For anyone visiting Madurai it would be a pleasure to shop there. You need to bargain brush up your bargaining skills. Let it be these unique artifacts you get or those old vessels used for custom sake or even the recent dazzling jewellery,you can get everything in Pudhu Mandapam Madurai. If you don’t get it anywhere in Madurai you could definitely try in Pudhu Mandapam, either they have the stocks or they know where to get it from. I got all my imitation jewels for wedding from Pudhu Mandapam, along with those add-ons we add over the blouse much inexpensive and not to mention with variety of design. 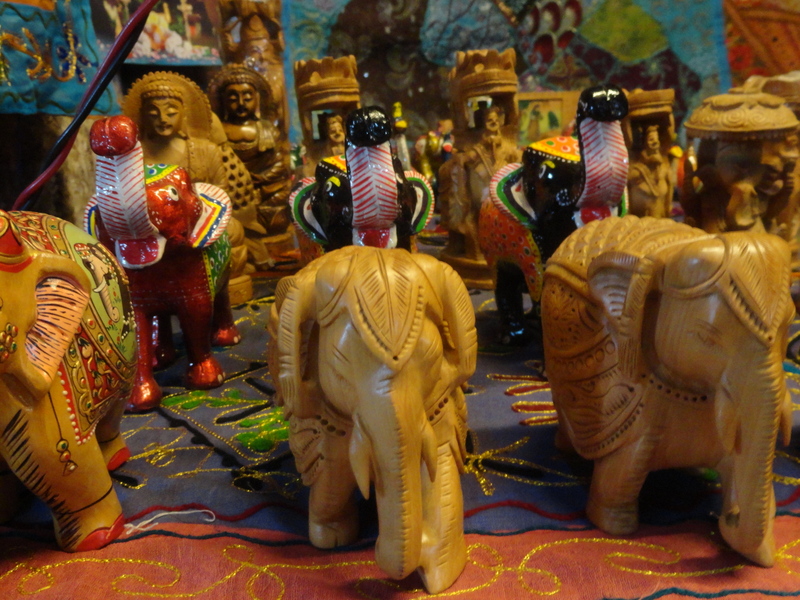 You can also find wooden toys, all those items needed for babies, pooja items. Though I am too old to play Housie, I still bought those Wooden Kitchen Utensils and remembered the good old days. I knew a friend who sent the parcel of these Wooden Toys to her Niece in USA. Many of us forget how non-toxic these are. I believe the Wooden Walker is completely out of Market. 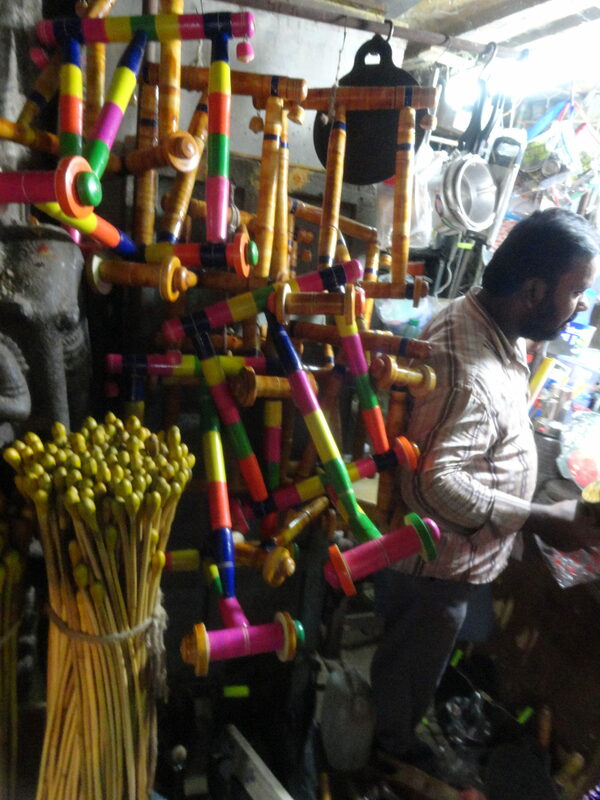 You can get non toxic wooden toys for a cheap rates in Pudhu Mandapam Madurai. In Madurai one could get anything only thing is know the place. It was originally a place of celebration. It turned to into a rustic shopping centre now. You might not get brands but all those you get there is amazing. 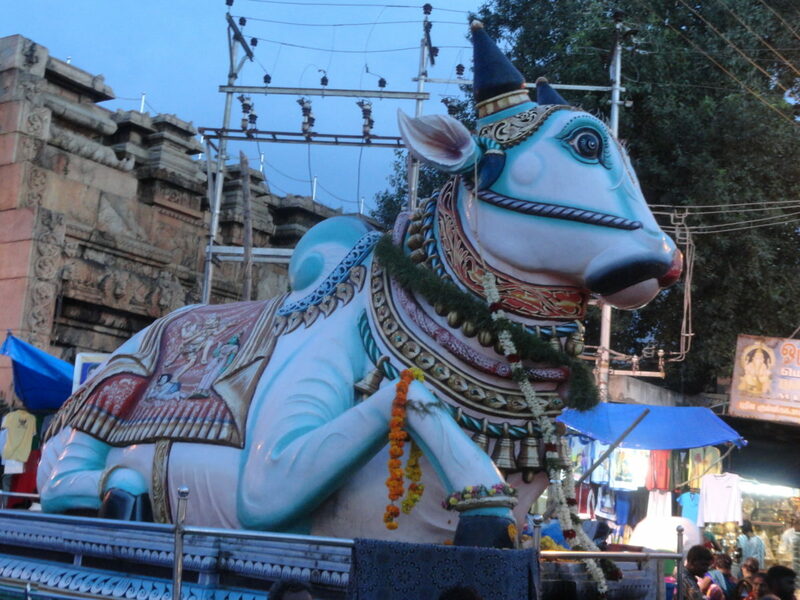 Located in the premise of the Meenakshi amman Temple ,Puthu mandapam welcomes you with the Huge Nandi. The pillars have rich carvings of sculptures and one side you find tailors doing amazing job and on the other the vessel shop,antiques, Women Accessories and those add ons for the blouse. To any pooja items, custom sake, keepsake,fashion sake items is always there . I really love this place and want it to be like this forever. There are talks about changing it into a museum , which I will not welcome. Some places should be left as it it and a small makeover with little renovation is fine. The shops will have to remain to make people understand the uniqueness. Only then flavor and the originality of the place will remain well. Please don’t spoil its nativity. For many people like me it is often a rescue. Like this article ? Then please do share it bookmark it. Coffeetabletalks will be glad to help you to know more about Madurai and nearby places. I seriously believe Madurai is more a place to experience the lifestyle and not to sight see. Follow us on Instagram and check out snaps from Madurai also.